The Wind Sphere™ relies on its "wind tunnel" effect known in physics as the Bernoulli Principle. While the rest of the wind industry generates energy through the use of free-stream wind, the Wind Sphere™ captures and amplifies the wind, which produces more kilowatt-hours (kWh). As wind encounters the Wind Sphere™ shroud, it becomes concentrated creating increased velocity and in turn, more power. By amplifying the natural wind speed, the Wind Sphere™ is able to produce more power from a smaller footprint. Proportionally, the Wind Sphere™ has the smallest footprint with the largest amount of power output in the industry. Because of these attributes, the Wind Sphere™ is uniquely designed to produce energy in urban, populated areas with space constraints. The inverter is IEEE 1547 compliant and UL 1741 certified. The Wind Sphere is currently in the process of the stringent IEC-61400-2 testing, also know as the Standard for Small Wind Turbines testing. Exhaustive field testing will be conducted by a Certified AWEA testing firm to verify performance and real world endurance. "With the Wind Sphere, building owners everywhere can now consider being a part of the renewable energy picture." 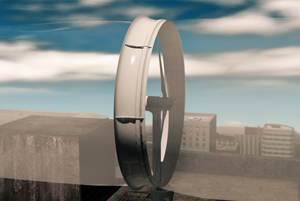 The Wind Sphere™ relies on its "wind tunnel" effect known as the Bernoulli Principle to capture and amplify the wind it intakes, which produces more kilowatt-hours (kWh).